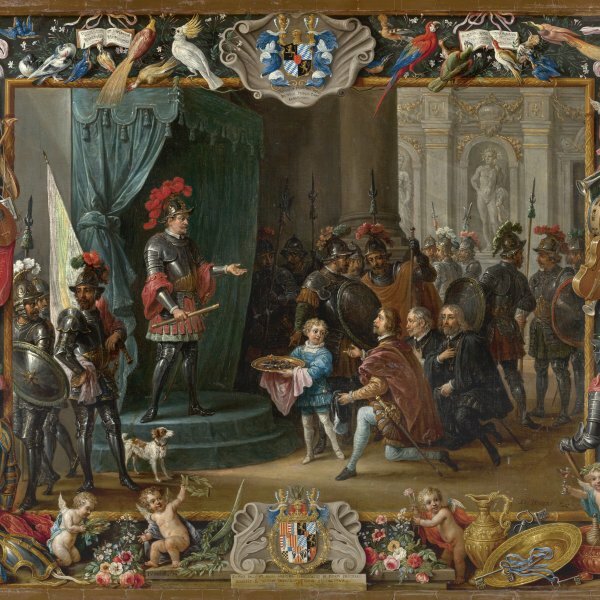 Jan Fyt first trained with the painter Hans van der Berch then continued his studies with the animal and still life painter Frans Snyders in whose studio he remained until around 1631. 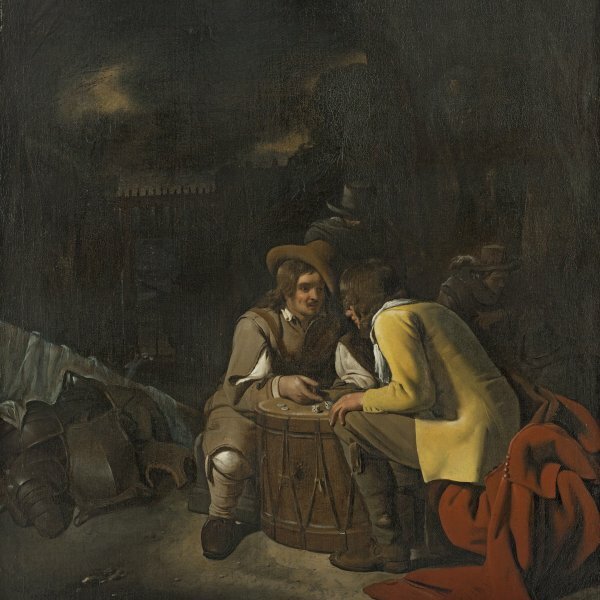 Like many other artists, he furthered his studies in Paris, between 1633 and 1634, and in Italy, working in Venice and Rome and visiting Naples and Florence, as documentary sources record. Fyt returned to Flanders in 1641 for family reasons. Like his master Snyders, Fyt specialized in still life painting. His compositions with dead and live game, arranged with other objects, fruit and vegetables, are among the finest works in his extensive oeuvre. Towards the end of his career he began to paint still lifes with fruit and vases of flowers, of which the present canvas is an example. Fyt developed a distinctive style in which his brushstroke became increasingly free and loose, which he skilfully used to convey the different textures of the elements within his compositions, particularly the fur of hares, rabbits and dogs and the plumage of birds. 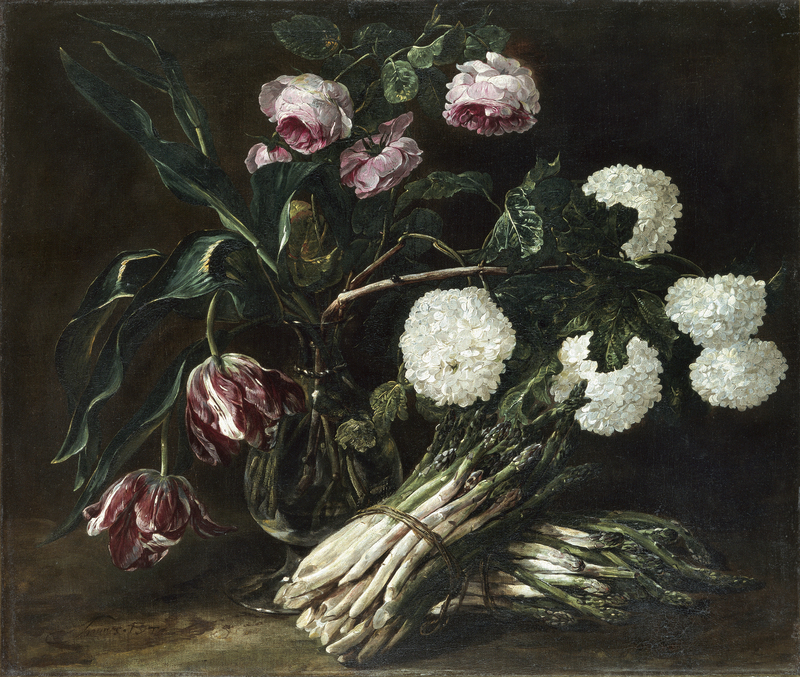 The present canvas dates from his mature phase, around 1650, and combines flowers and vegetables. Using a palette of predominantly greens and grey-browns for the background and the ledge, Fyt depicts a plain glass vase filled with the woody stems of white hydrangeas, as well as roses and tulips. Propped against the vase are two bunches of asparagus. The range of colours is relatively narrow but Fyt deploys a wide range of tones and chromatic gradations in this extremely natural composition. They include the pure, brilliant whites used to depict the tiny petals of the hydrangeas and the stalks and tips of some of the asparagus, as well as the greens of the asparagus and the three types of leaves in the vase. These shades contrast with the warm tones of velvety petals of the roses and the deep crimson of the tulips. Asparagus, which was a luxury foodstuff, is not frequently depicted in still life painting. However, we find other examples in the work of Fyt’s teacher Synders, for example, The Fruit and Vegetable Stall in the Alte Pinakothek, Munich, in which they are to be seen in a basket between different types of beans and a cauliflower. They are also depicted in a painting by Adriaen van Nieuladt entitled A Kitchen in the Herzog-Anton-Ulrich Museum in Brunswick in which they are placed on top of a pile of foodstuffs on a dish. Fyt depicted asparagus in a number of other works such as the painting now in The Hermitage, St. Petersburg. Gaskell referred to a composition that is notably comparable to the present one and which was in a private collection in Antwerp. The asparagus is replaced by grapes but the remainder of the composition is similar, particularly the vase and the types of roses and hydrangeas, a fact that suggests that Fyt may have used the same preparatory sketch for both works.